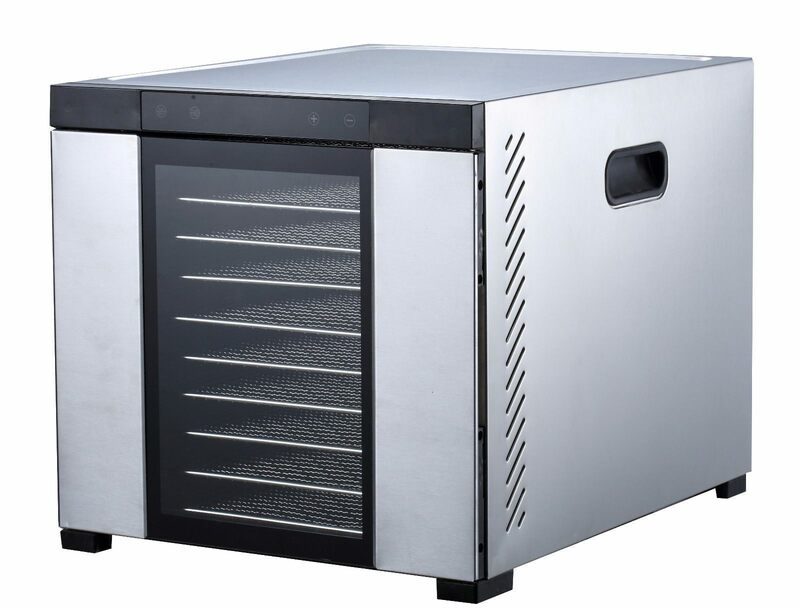 The Samson "Silent" Stainless Steel 10 Tray Dehydrator allows you to dehydrate up to a whopping 15.6 square feet of food at one time. Enjoy fresh, delicious, homemade dried fruit and vegetables, fruit leather, trail mix nuts and berries, dried herbs and spices, potpourri, pet foods, yogurt and much more. 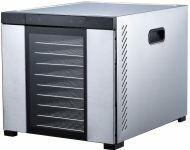 The Samson Silent dehydrator handles everything from fruit slices to beef jerky on ten spacious, height adjustable trays. The automatic fan promotes even drying and prevents the overheating that eliminates food's vital nutrients while the adjustable thermostat ensures that all foods are dehydrated at their optimal temperature. The Samson Silent dehydrator offers a generous 15.6 square feet of dehydration space. Trays can be removed to increase the drying height as needed. 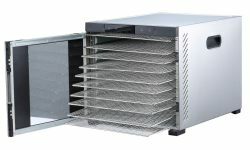 This dehydrator includes a Glass see-thru door that enables you to check on the food you are dehydrating without having to open the dehydrator. The digital controls on the dehydrator allows you adjust the temperature inside the dehydrator from 95 degrees F to 167 degrees F in increments of 9 degrees.